Located in Anchorage, Alaska, the Law Offices of Herbert M. Pearce provides experienced legal representation to clients from Anchorage, Wasilla, Big Lake, the Mat-Su Valley and throughout the region. Attorney Herbert M. Pearce has more than 18 years of experience handling complex family law and criminal defense matters for his clients. In his family law practice, Mr. Pearce routinely handles complex, high-asset divorce cases, contentious child custody disputes and other difficult legal matters. The scope of his practice also includes modifications and grandparents' rights, an emerging hot topic in Alaska family law. Attorney Pearce's criminal practice includes defending clients against a wide range of state and federal crimes, including violent crimes, drug offenses, drunk driving, white collar crimes and more. He practices in state and federal criminal courts throughout the state. Attorney Pearce is an accomplished legal advocate who provides clients with personal, attentive client service. Whether you are struggling with a difficult divorce or child custody matter, or have been arrested, he is committed to helping you pursue the most favorable outcome possible. The Law Offices of Herbert M. Pearce represents clients from Anchorage, Alaska, and throughout surrounding areas who are facing criminal defense and family law matters. If you face a divorce or family law problem in Anchorage, Alaska, the Law Offices of Herbert M. Pearce is here to offer advice and advocacy. Attorney Pearce has extensive experience handling family law matters for clients throughout Alaska. If you face criminal charges in Alaska, the Law Offices of Herbert M. Pearce is here to protect your rights. Attorney Pearce has extensive experience handling criminal matters in state and federal courts throughout Alaska. Are you a grandparent seeking child custody or visitation rights in Alaska? 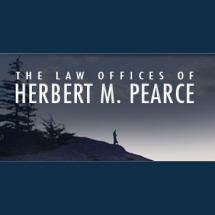 Contact the Law offices of Herbert M. Pearce today to speak with an experienced Anchorage, Alaska, family law attorney. If you are facing a divorce in Alaska, it is important to have an experienced attorney on your side. The Law Offices of Herbert M. Pearce provides knowledgeable divorce law representations to clients throughout the Anchorage area.